The Nintendo Switch is a fascinating new game console built around a novel and well-executed central idea. It also has plenty of problems that will doubtless be improved upon in a future version. Nintendo is yet again trying something new, and here we are to take the plunge alongside them. Note: This review is largely based on a week spent using a Switch provided in advance by Nintendo. They also sent two games: The Legend of Zelda: Breath of the Wild and 1-2 Switch, though in the days since the Switch came out I’ve played several other launch games. I’ve updated this review a few times since publication, and have noted updates at the bottom. This review originally appeared 3/1/17. The Switch is Nintendo’s seventh home console, arriving four and a half years after the Wii U landed in late 2012. Each recent Nintendo console has been designed around some big new idea—the Wii had those funky motion controls, the 3DS had glasses-free 3D, the Wii U had a big touchscreen in the controller. The Switch’s big idea is that it isn’t just a home console; it’s a portable console that can be plugged into a dock and converted into a living room console. It has a touchscreen much like any other tablet, along with two detachable “Joy-Con” controllers that can be used separately for two-player games or combined, Voltron-style, into a fully featured standard video game controller. That Swiss Army Knife versatility is the thing that sets the Switch apart from your iPad or your Wii U or your 3DS. In the future, Nintendo’s thinking goes, this one device can split into a two-player Mario Kart machine as easily as it can act as one player’s dedicated portable Zelda device. Up to eight Switches can network with one another in the wild, potentially forming the locus of a mobile multiplayer hoedown. It all sounds plenty interesting, if theoretical. A lot remains unknown about the Switch just days before it goes on sale. Many of its most appealing games, from Splatoon 2 to Super Mario Odyssey, won’t be available for a little while. Even a port of the Wii U’s 2014 Mario Kart 8 won’t be out until late April. A lot of the Switch’s built-in software features went operational just a day before launch. Some promised features, like the Virtual Console and video capture, are coming at an unknown date in the future. And as with any new piece of hardware, it is impossible to say whether the Switch will become popular enough that Kart tournaments at the summer BBQ will really become a new tradition. Some of those questions will be resolved over the coming weeks; others will remain unanswered for months or even years. What I can tell you, without need for guesswork, is that the Switch is a beguiling, flawed piece of hardware that isn’t like any other gaming system I’ve owned. It executes its main idea well enough that its shortcomings are alternately forgivable and all the more frustrating. It feels destined to be improved upon in a hardware revision (Perhaps the “New Nintendo Switch” in 2019? ), and this launch version will likely be remembered as a first generation console that wasn’t quite what it could have been. I predict the Switch will make a great many people happy, and a great many people angry. It is a Nintendo product, after all. The Switch comes out on March 3rd. It’ll run you $300 for the base console package, which includes the tablet, the controllers, the dock, and no games. This writeup from Nintendo’s recent Switch press conference is still a good resource if you want a full rundown of specs, features, and announced games. In the box: The Switch, two Joy-Con (multicolored or grey), a dock, two Joy-Con caps, a Joy-Con grip, an AC adapter, and an HDMI cable. The Switch plugs into your entertainment center via an HDMI output on the dock, which also has two standard USB ports and an input for the USB-C charger. You can’t plug it into the TV without docking, because the handheld has no HDMI output. You can, however, charge the handheld with the charge cable directly if you only want to use it as a mobile device. Nintendo says the Switch can get 3-6 hours of gameplay on a battery charge depending on the game; I’ve been able to play around three hours of Zelda before I have to plug in. Setup is fairly easy: You pop the back off of the dock and plug in the cables, then stand it up near your TV. Go through a couple of quick software setup steps in handheld mode, then drop the Switch into the dock and you should be off to the races. Here’s a feeling you probably know if you play video games: You’ve got a new game that you’re really excited about, but you’re about to go on a trip. Maybe a business trip, maybe a family getaway; doesn’t matter. There’s a specific ennui that sets in, a reluctance to commit to something you know you’re just going to have to put on hold. Sure, you could marathon a couple of nights, but your looming travel break will be stuck in the back of your mind. You play through the tutorial, then grudgingly put the game away until you’re back. This past weekend I found myself in that very situation. I had been unable to tear myself away from The Legend of Zelda: Breath of the Wild, the Switch’s phenomenal and seemingly endless marquee launch game. In a couple days I’d be traveling to San Francisco to cover the Game Developers Conference. Repeatedly I found myself thinking, “Aw man, better get in some Zelda time while I still can!” Then I would remind myself, wait, I don’t have to rush. I can just take it with me. On the flight to SF. The fact that I can lift my Switch out of its dock and immediately be playing a handheld version of the same game I was playing on my TV is one of the most remarkable things about this device. Equally remarkable is how the Switch functions as a portable split-screen gaming console with its own attached controllers. Place it on your airplane tray table and you’ve got a portable gaming system for your next flight. Set it up in the backseat and your kids can play together while you focus on the road. Hell, bring it on a camping trip and embrace the irony of ignoring the great outdoors in favor of Zelda’s rivers and forests. There are plenty of small things the Switch should do better, and I’ll get into those below. But it does this one fundamental thing very well. 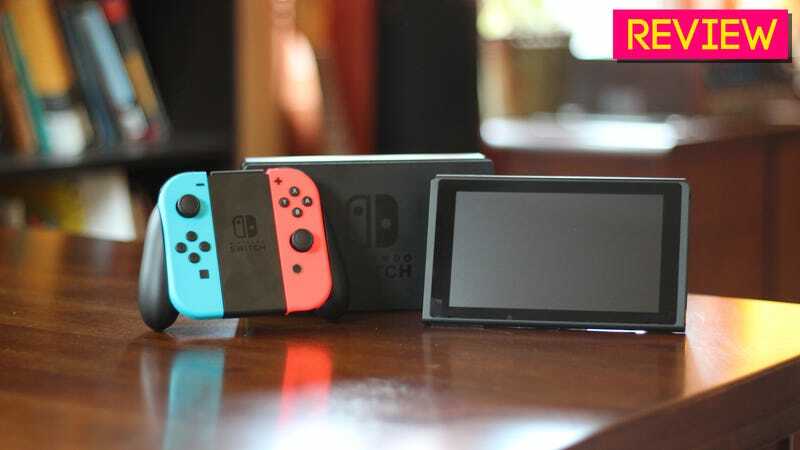 On the Switch’s sides are two smaller controllers called Joy-Con, which slide off the tablet screen and can be held separately or combined with an included grip and used like a standard Xbox or PlayStation controller. Placed on its side, a Joy-Con becomes a simple controller with a single joystick, four face buttons, a + or - button, and two shoulder buttons up top. The Switch comes with two slide-on caps for the Joy-Con that make them a touch larger and make the shoulder buttons easier to press. You can see a cap on the left-hand Joy-Con in the photo above. The Joy-Con are a nifty idea, though they don’t always work as well as I would’ve hoped. For starters, I simply haven’t found them very comfortable. I find that the buttons are oddly placed and the thumbsticks feel small and overly flippy. The shoulder buttons are easy to accidentally press, and I almost always hit them while sliding the Joy-Con back onto the tablet. The + and - buttons are placed high on the controller, out of easy reach of your thumb. Accessing the map in Zelda with the - button requires me to reach my left thumb up with an awkwardness that I wasn’t expecting after seeing photos of the controller. On the left, the Pro Controller. On the right, the Joy-Con combined onto the grip. 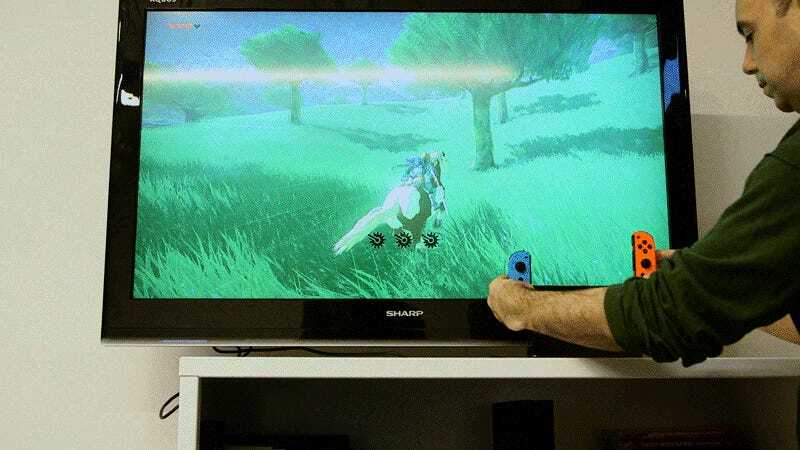 I spent several days playing Zelda with the Joy-Con combined onto the controller grip and while it was serviceable, I never got fully comfortable. The shoulder buttons were too easy to hit and the triggers a little too small, the thumbsticks were a little too light, the buttons placed a little too awkwardly. Late in the week Nintendo sent along a Switch Pro Controller, a more standard game controller that can be purchased separately. While it provided an immensely better experience, it also underlined the comparative shortcomings of the Joy-Con. They’re fine when they’re attached to the tablet in handheld mode. They’re useful for multiplayer games on the go (more on that in a sec). But, for games you’d play on your TV, they’re a lackluster substitute for a full-sized, standard game controller. I’ve also run into a frustrating issue where the left Joy-Con momentarily loses tracking and stops responding to my inputs. I’ll be playing Zelda with the two Joy-Con combined on the grip, and the left thumbstick momentarily detaches from the game. It might leave Link running forward for another 10 feet before stopping, or occasionally have him stand still even though I was pressing the stick to make him move. It appears to be an issue with a body part or other object blocking the Joy-Con’s view of the docked console, and I was able to make it go away by moving the Switch closer to where I was sitting. But the issue has come up for both me and my colleague Jason in the course of normal play, and I’ve seen it reported by several other reviewers over the last week. GameXplain made a video isolating the problem using the Switch controller calibration tool, and their findings reinforce that it’s an issue with body parts blocking the Joy-Con from the console’s view. Others are reporting the issue now that the console has launched, and Nintendo has acknowledged it while advising users to avoid placing the dock near certain things like cell phones, bundles of wires, and aquariums. (Bummer for you if you own a lot of aquariums.) This should not be an issue for a game controller in 2017, and it’s pretty annoying. 1-2 Switch will likely be the Switch’s less talked-about launch game, though it actually makes a more compelling case for the Joy-Con than Zelda. It’s a collection of silly minigames mostly designed for two people, and it’s meant to be played without looking at the screen. You prop up the Switch screen between both of you and, as the game will repeatedly instruct, you both look away from the screen and into each other’s eyes. You then engage in safe-cracking speed tests, quickdraw shootouts, dance competitions, yoga showdowns (! ), and cow-milking competitions (!!) guided entirely by audio and your controller’s vibration. Each 1-2 Switch minigame begins with a goofy demonstration video. In this one, you’re entering safe combinations. That vibration is a crucial part of the experience, and the Joy-Con provide enough detailed vibratory feedback to make the games in 1-2 Switch much more fun. Thanks to carefully controlled vibration, your Joy-Con goes from being a cup full of dice to a ticking dial on a safe lock. While some minigames are more fun than others, they collectively paint a picture of how Nintendo’s designers could creatively use the Joy-Con in the future. I’m skeptical this sort of game will actually catch on, but Nintendo has created the technology to allow it. The Joy-Con will also work for more straightforward multiplayer games like Street Fighter, Mario Kart and Bomberman, with each player holding one controller while sharing a view of the system’s screen. The Joy-Con are small but they’ll likely work nicely as simplified portable controllers. I could also easily see myself having a great time linking up with a second Switch to play against a couple of friends in a four-player game, and suspect it’ll be nice to be able to do so around the dining room table rather than clustered around the TV. I’ve been unable to test much of how the Switch’s local co-op will work, but given what I’ve used of the console I can easily see it being a selling point. The Switch handles the big stuff well, but the hardware has noteworthy shortcomings. The kickstand on the back of the Switch is flimsy and seems destined to snap off. It props up the screen at a steep angle unsuited to a lot of situations and generally feels unsteady. It also doubles as a cover for the MicroSD card slot, so if it does break, your memory card will be exposed. Both the Joy-Con grip and the Pro Controller lack a headphone output, putting the Switch behind the PS4, Xbox One and even the Wii U in terms of allowing you to easily listen to game audio on headphones from your couch when you’re using the console to play a game on the TV. The charging port is on the bottom of the Switch, which is fine when you’re holding it but means you can’t prop up the screen on a table while charging it, because the plug gets in the way. The release buttons you use to detach the Joy-Con are small and hard to press without accidentally pressing other buttons as well. The caps that slide over the Joy-Con when you’re using them separately are oddly tricky to get on and off. There’s no HDMI output on the tablet, so if you want to plug the console into a TV at a hotel or your relatives’ house, you’ll need to bring the dock with you. There’s no support for bluetooth headsets, which feels like an omission in a high-tech tablet device in 2017. You can’t transfer your saved games to a new console or a MicroSD card, which means there’s currently no way to back up your saves. If you want to use the included AC adapter to charge the console on the go, you have to open up the dock and remove it before taking it with you. The included HDMI cable is a hair under 5’ long, a foot shorter than the 6’ that I’ve come to think of as standard and too short to use in my entertainment center. Apparently Nintendo likes shipping things with cables that are too short. The included Joy-Con grip doesn’t charge the controllers, so if you use the Switch for TV gaming and want to charge the Joy-Con every night you’ll have to disassemble the grip controller and re-attach the Joy-Con to the handheld in the dock. It’s an awkward process, and your only alternative is to buy a Pro Controller or shell out $30 for a nearly identical “charge grip” with a USB input. Each of those things isn’t really a big deal on its own, though they’ll be a bigger deal for some people than for others. Even when taken together, they don’t undermine how much I like the Switch for what it does well. But they’re all noteworthy shortcomings, and I can’t shake the feeling that many of them will be addressed when Nintendo launches a new Switch model in a couple of years. This is how it always goes with new, ambitious technology. These sorts of shortcomings are perhaps an inevitable tax on early adopters, but they are a tax nonetheless. I Really Like How It Does Screenshots? I realize I just listed a lot of gripes, so here’s one thing I really like: The screenshot button. Nintendo has followed Sony’s lead and added a dedicated screenshot button to the Switch. It’s responsive and easy to reach on the left Joy-Con; the onscreen notification pops up much faster than the PS4, even. You’ll have to imagine the satisfying “click” sound that plays. It makes a nice sound effect, and it’s easy to browse through your stored screenshots. You can upload your screenshots to Twitter or Facebook straight from the console and in the future it’ll apparently even be possible to capture videos. For now, it’s just nice that the feature is built-in. I love being able to take screenshots while I’m playing, and I’m glad Nintendo included it. Three hundred dollars will get you a box with a Switch in it, but if you want to have the best experience, you’re going to have to cough up quite a bit more. Let’s tally the hidden costs. First and foremost, you’re going to need to get some games, since the Switch comes with no bundled software. Zelda will be a natural choice for many, and that goes for $60. Let’s assume that’s the only game you get. The Switch comes with 32GB of onboard storage space, which is going to fill up extremely quickly. Physical games on carts thankfully don’t install to the hard drive, but if you want to download more than a couple games from the eshop you’re going to need a microSD card. (In fact, there’s already at least one game so big that it won’t even fit on the Switch’s built-in storage.) 256GB cards go for more than $100, so let’s say you get a 128GB card for $40. I also highly recommend getting a Switch Pro Controller, which costs $70. Not only does it not suffer from the Joy-Con tracking issues I ran into, it’s more comfortable and easier to use than the Joy-Con mounted on the grip. The Pro Controller also makes it much easier to use the Switch to “switch” seamlessly. You pop the console into its dock, pick up the controller, and play. If you want to take it on the go, pop it out and you’re ready to rock. Without a Pro Controller, you have to disassemble and reattach the controllers each time you go from TV to mobile, as well as anytime you want to charge the Joy-Con. It significantly slows down an otherwise pleasingly snappy process. The only carrying case guaranteed to keep the Switch warm when camping. You’ll also need a carrying case if you’re going to take the Switch anywhere. You could go for my colleague Stephen’s wool sock method, but that won’t keep the Switch all that safe, and the system definitely feels pretty fragile. There are already a ton of third party options, but let’s stay first party and go with Nintendo’s carrying case, which doubles as a stand and comes with a screen protector. That costs $20. Lastly there’s the issue of power. I’ve mentioned how much of a pain it is to unplug the AC adapter in order to take it with you when you travel, so most people are going to want to buy a separate USB-C wall adapter to charge the handheld on the go. I found a Motorola 5V 3.4A charger that does the trick. Be mindful that you won’t be able to charge and play at the same time if you only use a USB-A to USB-C cable plugged into, say, an iPhone wall adapter. That’ll charge the Switch slowly when it’s turned off, but in my experience it doesn’t provide enough juice to charge while you’re playing. You’ll need a dedicated adapter capable of putting out a lot of power if you want to charge and play at the same time. The adapter I got ran me $15. Most new video game consoles arrive alongside a couple of big budget launch games. Rarely do those games make much of a lasting impression. (Anyone up for some Ryse: Son of Rome or some New Super Mario Bros. U? Wanna play a little Knack?) With the Switch, Nintendo is bucking that convention and harkening back to their Super Mario 64-driven Nintendo 64 launch by offering an unusually small launch lineup dominated by one spectacular game. That game is The Legend of Zelda: Breath of the Wild, and it is a stunner. I’ll leave the actual reviewing to my colleague Jason, who has finished the game. Suffice it to say that this latest Zelda is an astonishing demonstration of what Nintendo’s best creative minds are capable of. At times I have had to consciously separate my adoration for the game from my more complicated feelings about the system on which I’m playing it. Breath of the Wild, which is also out for the Wii U, doesn’t take advantage of most of the Switch’s unique features. It doesn’t have local multiplayer, nor does it require you to detach the Joy-Con. It has motion controls, but they’re nothing special. However, my 30-ish hours with the game have still illuminated some things about the Switch. For starters, it is a mild shock to the system to play a console game of this scope and depth on the go. I know that some tablets and portable PC gaming devices have offered similarly uncompromising portable gaming in recent years, but because the Switch actually is the same console I plug into my TV, it feels subtly different. I’ve played Breath of the Wild in the back of a cab, while waiting for the doctor, and on an airplane. I’ve also played while lying in bed or reclining on the couch. I’ve always drawn a line between the games I play at home and the games I play on the go, and the Switch blurs that line in a welcome way. Because Breath of the Wild is so massive and engrossing, it’s helped reinforce how much I enjoy popping the Switch out of its dock and picking up immediately where I left off. I want to play this game on the go, and now I can. You have to be careful about lightning in this game. You’ll see. 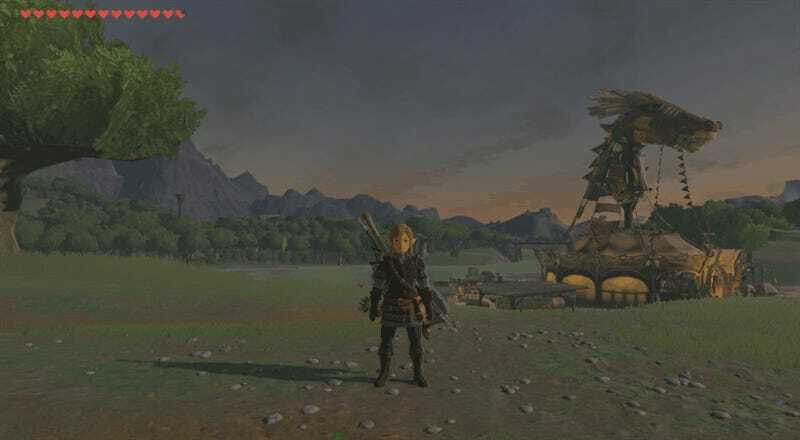 Breath of the Wild looks and performs noticeably worse when plugged into the dock than it does in handheld mode, a potentially worrying indicator of how the Switch’s graphics processing hardware will hold up over time. When I play on the TV, I notice frequent dips below the game’s 30fps frame rate, sometimes to the point that it’s genuinely distracting and makes it harder to play. Any time I’m running in tree-shade on a sunny day in Hyrule, zooming in for a closer view, or moving quickly through the rain, it feels like things drop into at least the 20-25fps zone. If I pop the console out of the dock and start playing in tablet mode, everything immediately runs more smoothly. The frame rate is solid in the same places (with a few exceptions), and the overall image is crisper. The disparity is likely because the Switch runs at 720p resolution in handheld mode and bumps up to a more demanding higher resolution (1080p in general, 900p in the case of Zelda) when plugged into the TV. Breath of the Wild is a massive open-world adventure with numerous complicated simulations running on top of one another. It’s the most technically ambitious Nintendo game I’ve ever played. I understand why it would be a challenge to get it running smoothly, but it’s still a shame that it suffers when played on a TV. Furthermore, it’s worrisome that Nintendo’s own developers have been unable to get their top-billed game running equally well on TV and in handheld mode. Hopefully it’ll be less of an issue as the people making Switch games become more familiar with the hardware. It’s not a reassuring start. On the whole, though, playing Breath of the Wild on the Switch has been a treat. The game is also available on the Wii U, and while I haven’t tried that version, my colleague who’s played and the other more technical comparisons I’ve seen indicate that the Wii U version offers slightly lower fidelity than the Switch version but is basically fine. Something people should keep in mind when weighing it as a reason to take the Switch plunge. Zelda will dominate the discourse surrounding the Switch, but new Switch owners will have a handful of other admittedly less exciting games to choose from as well. Several are games we’ve already written about that you can already play on other systems, the lovely if slightly uninspired JRPG I Am Setsuna and the fantastic side-scrolling throwback Shovel Knight among them. Both games run well on Switch, particularly in handheld mode, though Shovel Knight suffers from the Joy-Con’s lack of a proper D-pad. There’s also a new Just Dance game as well as a new Bomberman, the latter of which seems grossly overpriced at $50 but should be a good showcase for mobile multiplayer. There’s also the enjoyable if overly familiar racing game Fast RMX, a Wipeout-esque hover-racer that allows for online or local split-screen multiplayer. I’ve yet to try the new Switch-only co-op game Snipperclips, though I’ve heard good things and look forward to playing it. The other Nintendo-developed Switch launch game is 1-2 Switch, the oddball local multiplayer game that I detailed earlier. I like it enough to want to break it out when I’m over at a friend’s house, though I sense the novelty will soon wear off. It’s a great demonstration of some of the Switch’s more distinct features, but it really feels like it should have been bundled with the console rather than sold separately for $50. The upcoming port of Mario Kart 8 will have some new characters, including Squid Girl from Splatoon. I’m guessing that won’t really soften the blow of having to buy it for the second time in three years. The Switch has a few promising games on the horizon for 2017, which should keep people occupied while they wait for Nintendo to stop screwing around and announce a new Metroid. April’s Mario Kart 8 Deluxe will likely be a required purchase for anyone looking to play games on the go, though it is galling as ever that Nintendo would ask us to re-purchase a game many of us bought just a few years ago. This summer’s Splatoon 2 will doubtless be a good time, and the winter’s Super Mario Odyssey looks like a blast. There’ll also be a variety of ported indie and third-party games on Switch over the coming months, including Bethesda’s 2011 role-playing game Skyrim in the fall and a healthy collection of good indie games like Stardew Valley, Thumper, Overcooked, Runner3 and The Binding of Isaac at various points throughout the year. All that means 2017 won’t exactly be a barren wasteland for new Switch adopters, but the fact remains that exciting Switch-only games will be few and far between and will predominantly come from Nintendo. The majority of the Switch’s third-party software will consist of games that’ve been playable on other systems for years. As with any new hardware launch, expect a fallow period after the initial glow wears off. Even a game as tremendous as Breath of the Wild can only carry a new console so far without help. Nintendo’s console operating systems have always had a touch of quirk to them—those bouncy eshop theme songs, or the way downloaded 3DS games arrived gift-wrapped on your dashboard, or the milling masses of Miis on your Wii U dashboard. The Switch is Nintendo’s least playful operating system by far, a functional collection of quiet menus that’s downright austere compared with its predecessors. With the small day one update installed, the Switch gains a touch more functionality than it had during our first week of reviewing it, but the software is still pretty stripped down. You can share screenshots to social media and copy them to a microSD card, and you can link to your Nintendo account and hit the eshop to download one of a handful of digital games. Somewhat shockingly, you can’t copy your saved games off of the Switch or onto a MicroSD card. Nintendo has confirmed that there’s currently no way to back up Switch saves. If you lose your console, your 100 hours of Zelda progress are forfeit. Above: The Switch home screen. You can add friends by browsing through a list of people you’ve played with, through a local wireless connection, or by entering the 12-digit friend code assigned to each account (ugh). At least the friend code process only requires one player to enter a code, which sends a request to the other for approval. A Nintendo rep told Polygon they’re going to be adding additional methods for adding friends in the future, including a suggested list based on your social media friends lists. Nintendo Accounts will work much the same as they have on previous Nintendo systems. You can have one active console linked to your account at a time, and only that machine can access your digital purchases. You can deactivate the link and re-link to a new machine whenever you want. If you break or lose your Switch, you’ll have to go through Nintendo and have them unlink it from your account before you can activate a new one. The Switch interface is nice and snappy, and in that way it’s a significant improvement over the Wii U and the 3DS. But there’s a certain charm missing that hopefully wasn’t just a necessary sacrifice on the altar of usability. There’s no background music in any of the menus, nor even on the eshop. It’s a departure for Nintendo and a bit of a bummer. Nintendo’s operating system music has long been a fascination of mine, and I’m sad not to have a new collection of earworms to hum. Much of anything about Nintendo’s new paid online service, network, and multiplayer. Nintendo has said that they’ll have a new paid online service, which we can assume will work similarly to the PlayStation Network and Xbox Live. They’ve said that we’ll have to use our phones for chat, so it’s fair to assume it will require some sort of smartphone app. Friend requests are currently rudimentary and we don’t know much about any additional planned online functionality—making groups, partying up, sending messages, or what if any sort of social network might replace the Miiverse. Above: A screenshot from Earthbound, a classic game that I already own on Wii U and 3DS and that Nintendo will almost certainly ask me to buy yet again on Switch. Maybe I’ll actually play it this time. Anything about Virtual Console. The Switch could be a killer device if Nintendo gets the Virtual Console right. It’s easy to imagine a world where we can play a variety of old NES, SNES, N64, Gamecube, Wii, and even Wii U games at home or on the go on a single system. Hell, maybe some Game Boy Advance ones, too. Unfortunately, Nintendo has made no announcements about how Virtual Console will work on the Switch, saying only that it won’t be available at launch. We’re not even sure which of those machines it can emulate. It’s possible Nintendo will completely botch the Switch Virtual Console, and possible they’ll knock it out of the park. Given their history, the former seems more likely. For now, we just don’t know. Anything about non-gaming apps. It’s safe to assume that at some point, the Switch will get apps for popular video streaming services like Netflix, Amazon and Hulu. But those apps aren’t going to be there at launch, and we don’t know when they’re coming. Nintendo recently told us support for video services is “being considered for a future update.” This is a gaming device only for now, and it’s not clear when that’ll change. The usual stuff we don’t know about a new console. There are also things we don’t know about the Switch that are more run-of-the-mill. We don’t know whether it will sell well enough to entice developers to make games for it. We don’t know if it will become popular enough to catch on as a local social gaming phenomenon, or if we’ll see Switches all over the place at gaming gatherings like PAX and E3. We don’t know all the games coming out this year; there may well be a hidden gem or two waiting to surprise us. And of course, we don’t know if the Switch games that have been announced will actually be any good. The Nintendo Switch is an experimental game console from a company with a storied history of making experimental game consoles. Whether it will go down as one of Nintendo’s successes or failures remains to be seen. Big picture: I fundamentally like using the Switch. It accomplishes its central goal admirably, and has already gotten me thinking about it differently than my other game consoles. It also has a number of irritating flaws and hidden costs, and there are still things about it that Nintendo hasn’t explained. Any new gaming hardware is defined by the games it can play, and here the Switch bucks convention. It has a single sensational launch game, albeit one that can also be played on the Wii U you might already own. The rest of its launch lineup is nowhere near as compelling, but the fact remains that playing this Zelda on the Switch has been one of the finest gaming experiences I’ve had in years. I suspect that, Wii U version or no, Breath of the Wild will entice a lot of people to buy a Switch. I couldn’t fault them for doing so. My recommendation is still to wait. Of course, if you’re excited as hell about the Switch and know that you want one, go for it. But if you’re on the fence, I say hold off. Wait and see if Nintendo addresses some of the hardware issues people have reported. Bide your time and let them release more games. In six months we’ll know a lot more about how this unusual new console works, and there’ll be a lot more things to play on it. Nintendo has made another bold gamble, and only time will tell if it’ll pay off. Update 3/2/2017: Nintendo has released the day-one software update that lets us get online. We can now link a Switch with our Nintendo Accounts, access the eshop to download games and send out friend requests, among other things. I’ve added a section covering the finalized operating system and adjusted the “what we don’t know” section accordingly. Update 3/3/2017: I’ve added new information about linking your Nintendo Account to the Switch, managing your saved games, and transferring digital purchases, as well as Nintendo’s acknowledgement of the Joy-Con wireless issue. Update 3/6/2017: I’ve fleshed out the section about launch games now that I’ve played a few of them and made minor edits throughout to more consistently reflect what we now know about the system.